A half century after his death, David Park (1911-1960) is recognized as one of America’s most important twentieth-century painters. He was the first of the brilliant post-World War II generation of artists to break with Abstract Expressionism’s hegemony and return to painting recognizable subjects, most powerfully the human figure. Park’s original cohorts of Bay Area Figurative painters were his close friends Richard Diebenkorn, Elmer Bischoff, and Hassel Smith. All outlived him—Smith by nearly fifty years—and enjoyed recognition and fame during their lifetimes. Park’s reputation is just now fully coming into its own. 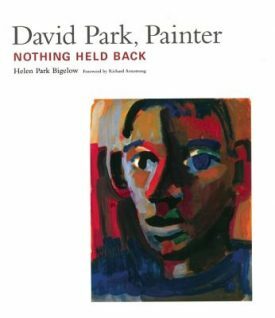 In David Park, Painter, Park’s younger daughter, writer Helen Park Bigelow, paints a mesmerizing, deeply moving portrait of her father’s life and early, difficult death. Park left high school in New England without graduating and came west in order to paint. He married Lydia (Deedie) Newell when he was nineteen and was the father of two by the time he was twenty-two. We are brought into a family rich with moral conviction, ingenuity, smart and gifted friends, music, and art: four complex people guided and inspired by values of integrity. Those same values guided and inspired David Park’s painting. HELEN PARK BIGELOW is the daughter of David Park, as well as a writer and potter. She and husband Edward B. Bigelow live in Hawaii, where she writes and teaches.